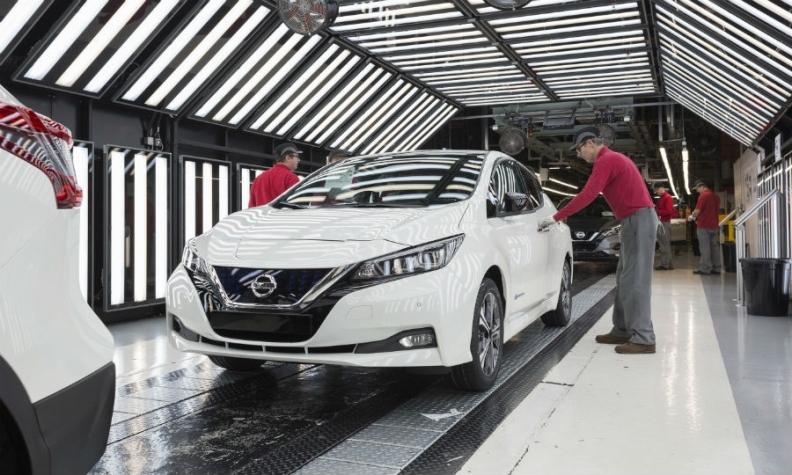 Nissan began production of the latest-generation Leaf for Europe in December at its Sunderland, England, plant. Nissan took a big risk when it invested billions to become an early leader in Europe's fast-growing electric vehicle sector. The arrival of its second-generation Leaf this year is just part of the automaker's strategy to maintain its position in the sector. 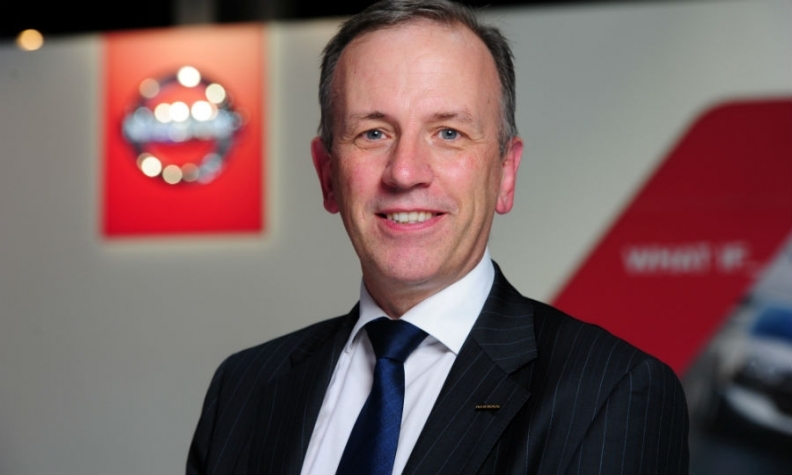 Nissan Europe Chairman Paul Willcox outlined the automaker's multifaceted electric plans during an interview with Automotive News Europe Associate Publisher and Editor Luca Ciferri. What is Nissan's competitive advantage in the electric vehicle sector? In addition to having a robust lineup of pure-electric vehicles, we are one of the few, if any, that is talking about the role of an electric vehicle beyond the vehicle itself. We are looking at how to manage the second life of batteries -- the energy storage opportunities -- and we have a business model. We plan to grow that and monetize it, making it a revenue stream for us. Secondly, we also have VTG [vehicle to grid]. We think that VTG provides a much bigger role for electric vehicles than just building them. What is the biggest advantage of VTG? It is a competitive advantage today. I'm not sure it will be in the future, maybe others will follow because everyone seems to be following what we do. VTG is bi-directional charging. You can charge your Leaf at home and, when it is full of energy, you have a choice. You can drive the car or you can put the energy back in the grid at a time of peak consumption and get paid for doing this. Isn't that risky for the car owner? The trick is managing the consumption for the driver. We know that very few European Leaf customers with a full charge will deplete the battery in a day. It just won't happen because the kilometers they cover are significantly less than the capacity of the battery. In that environment, there can be an opportunity for an energy provider to take energy from the vehicle at peak times. That is the model we are working on. Willcox: "We are one of the few, if any, that is talking about the role of an electric vehicle beyond the vehicle itself." You have said that Nissan has done its part to help create a market for electric vehicles by investing billions to create products such as the Leaf. Now you feel it is time for national governments and city municipalities to do their part. Is this possible given that most cities and states have huge budget constraints? I think the bigger challenge is not so much budget. Where we have seen success is where you get a strong clear vision from the national government on the drive to electrification. This entails lining up players in the energy sector, transportation, infrastructure and having one common policy. You can then write your budgets in a thousand different ways. If you're smart, you can be fiscally neutral because you can use a bonus/malus system. The bigger challenge is the hard work to get everyone aligned. As an example, if you want to put a charging infrastructure in place and you don't have a common understanding of how that can be managed from a regional to a national level, it's chaos. Smart says it will go fully electric by 2022. Volvo has announced it will electrify all its new models starting in 2019. Why isn't Nissan making a similar, bold statement? We're not making a statement because it is quite difficult to forecast where the market is moving. What we do know is electrification will become a much greater pillar for two reasons. First, our research shows that consumers are much more receptive to electrification compared with 10 years ago. This is a massive transformation. Secondly, all our competitors are joining, so the EV market will grow. In the midterm, we don't see the whole market moving toward one technology. It will be a blend of technologies. We have full electrification on the Leaf and ePower, our inline hybrid technology, in Japan. Over time, we will bring e-Power to Europe. Therefore, we're not saying, "By this date, we'll be completely electric," because we think it's difficult to tell whether that's appropriate right now. Nissan decided to sell its battery division to a Chinese fund. Why? When we started, there was no battery, so we had to develop our own. Today, we have a very robust battery technology, but if you think about the future, we have to make some real strong strategic decisions on investments. We have strong investment requirements to develop electric vehicles and autonomous drive technologies, while continuing to invest and build connected cars because we think future mobility is dependent on connectivity. This article is from Automotive News Europe's Talk from the Top supplement, which features interviews with leading automaker and supplier executives in the European automotive industry. Click here to download the supplement.